We have found lately that we can easily slip a two-week trip into our calendar immediately after Christmas. Other than the inconveniences associated with visiting a location during the holiday period, it seems to have worked out for us. 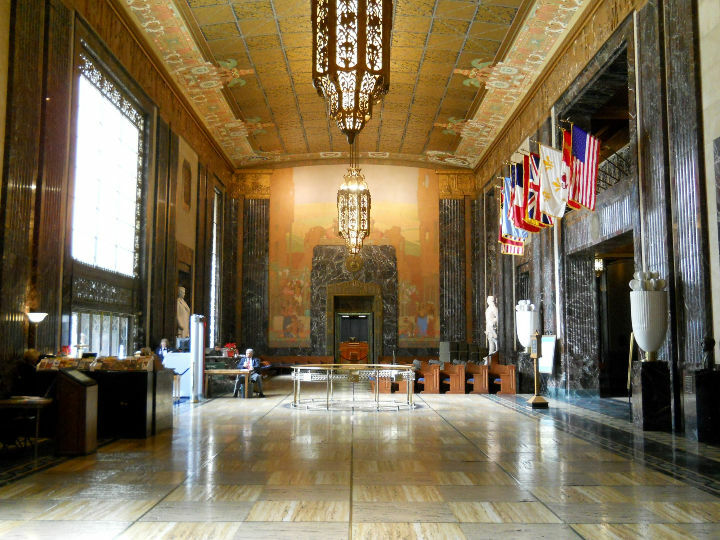 This time we went to Baton Rouge, the State Capital of Louisiana, located on the Mississippi River north of New Orleans. It is one of the largest ports in the US. The area is a center for many historic buildings and plantation homes. It also offered some interesting camping parks on the way there and back. [Wednesday] We got a relatively late start of a little past 11 am on December 28th, as we headed East on Alt-90, IH-610 and IH-10 toward Louisiana. Our lunch stop was just East of Baytown. 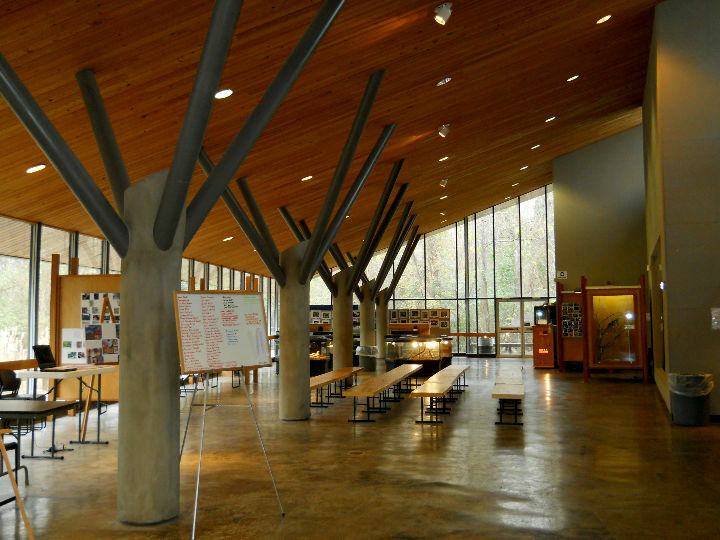 As we crossed the Sabine River into Louisiana, we stopped at the Louisiana Welcome Center to pick up some brochures of Baton Rouge are attractions. It only took a few minutes then to get to the LA-109 exit. 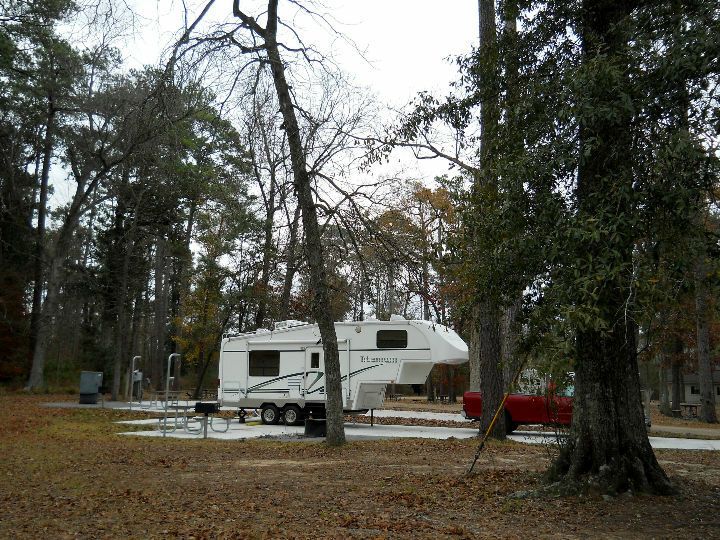 We took LA-109 North to Niblett's Bluff Road, which lead us to Niblett's Bluff Park on the shore of the Sabine River. We got into site #56 right on the river, with a nice view of the fishing pier. < Our campsite. 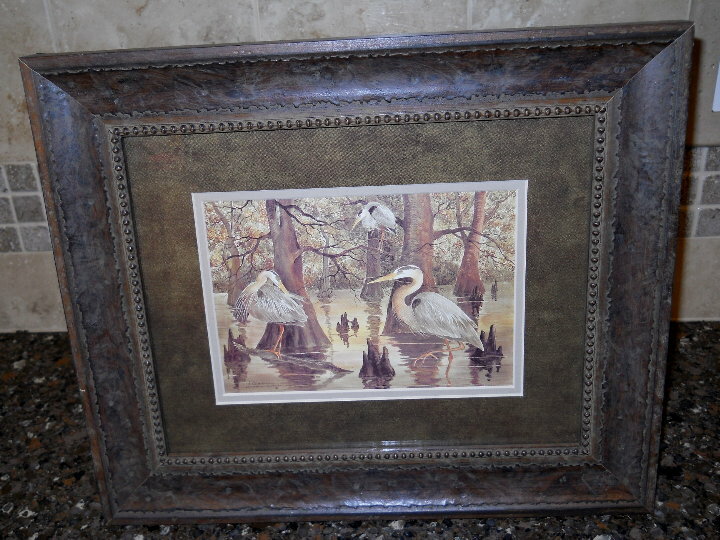 < Sabine River. 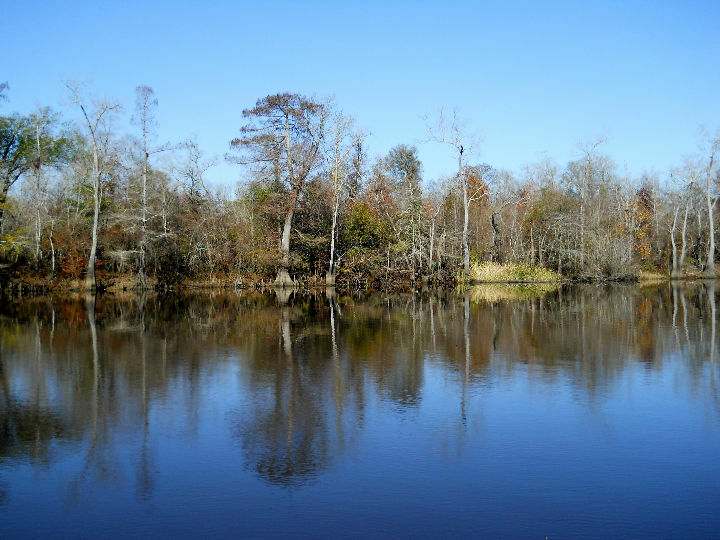 [Thursday] We walked around the park, which is bordered by the calm and gentle Sabine River. The fishing must have been pretty good, because folks were putting boats in and out. 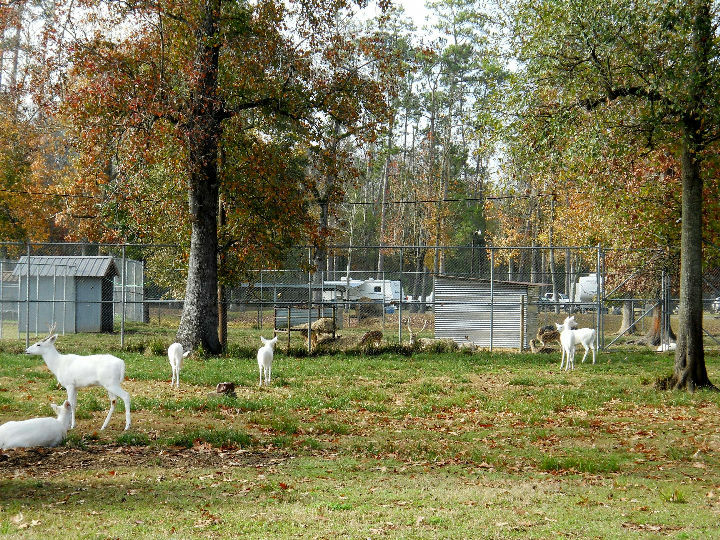 They have quite a collection of exotic deer in fenced areas. 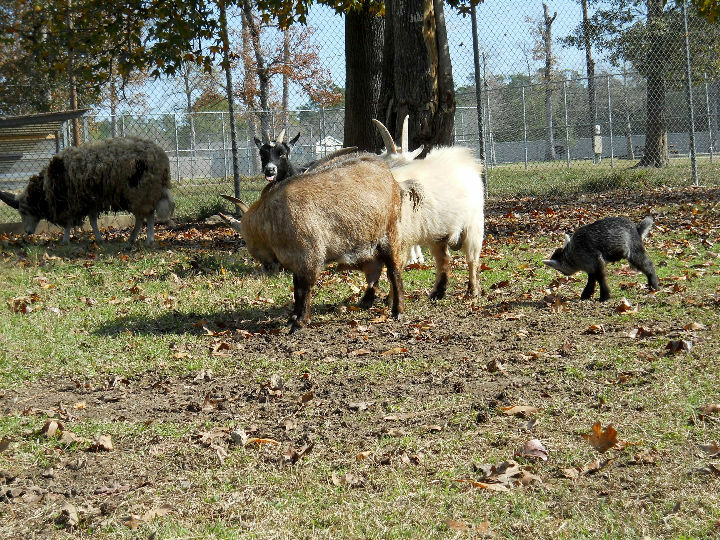 They also had a variety of goats, with a little goat that had been born a few days ago. 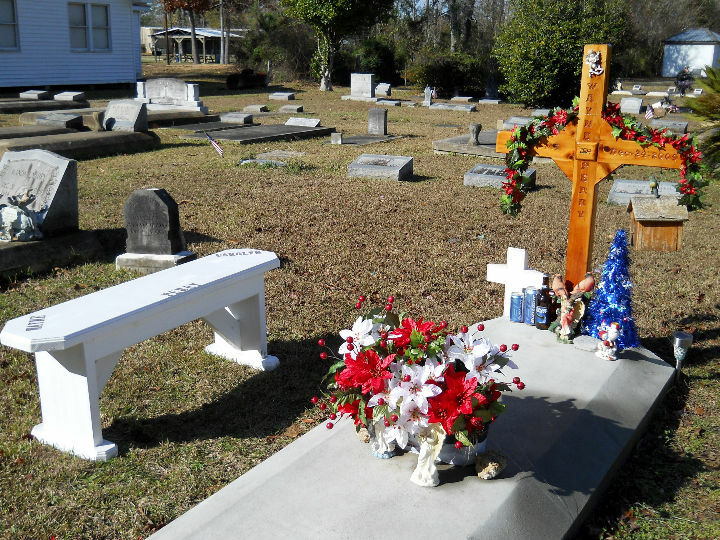 Next to the park are the Niblett's Bluff Church Museum (which wasn't open) and the very interesting Niblett's Bluff Cemetery. Some of the grave markers were unusual, with various artifacts, including cans of Bud Light beer. It was reminiscent of the Egyptian Pharaoh's tombs that were loaded with things for the afterlife. After lunch, we continued East on IH-10 to Baton Rouge, where we arrived at Night RV Park around 4:30 pm. The park is a standard old style commercial park with mostly permanents (lots of FEMA trailers - this is Louisiana), probably left over from Hurricane Katrina. It's certainly not much to look at, and not a park that we would recommend for other than how we used it - but we only used it as a place to sleep, since we spent the days out site seeing. < Exotic deer. < Assorted goats. < One of the unusual graves. [Friday] We got a late start for our first day of site seeing, only leaving the trailer around 11 am. We drove west on Florida St. all the way to downtown. After unsuccessfully trying to locate the Visitor Center, we decided to eat our lunch we had brought on the LSU campus. The campus was almost vacant due to the Christmas/New Year vacation. 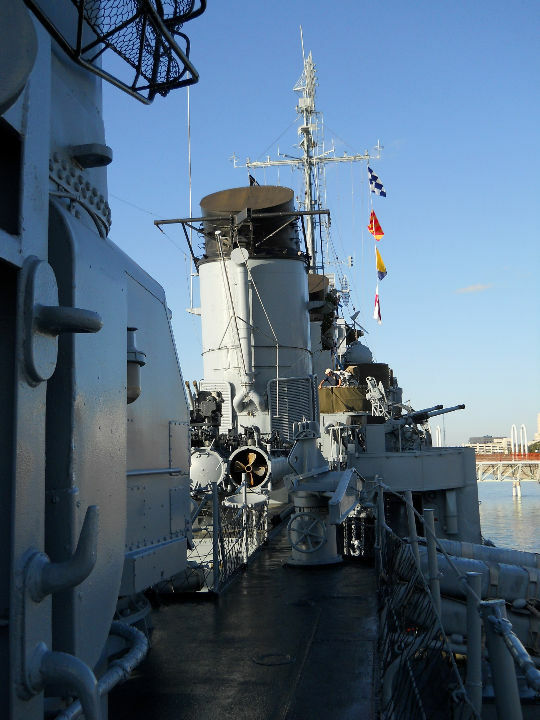 Afterwards, we went back downtown and toured the USS Kidd Museum and the USS Kidd WWII Fletcher class destroyer. 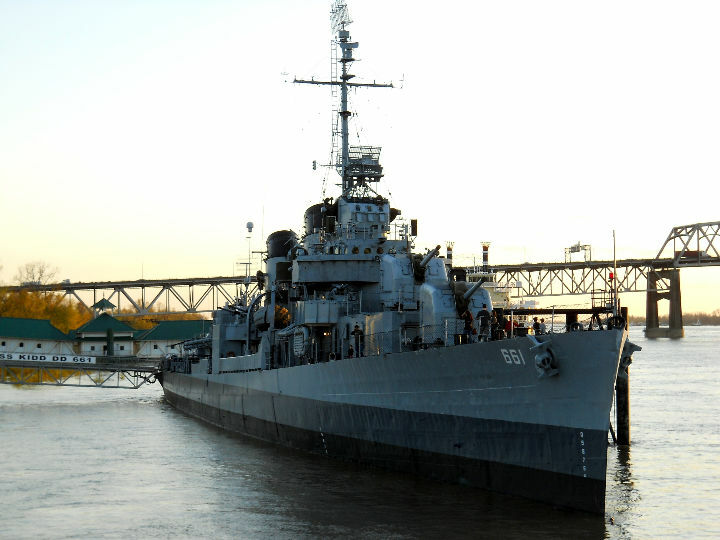 The ship was damaged by a Japanese kamikaze attack in the Battle of Okinawa, but was repaired and used during the Korean Conflict, then restored and docked in Baton Rouge. < < USS Kidd. 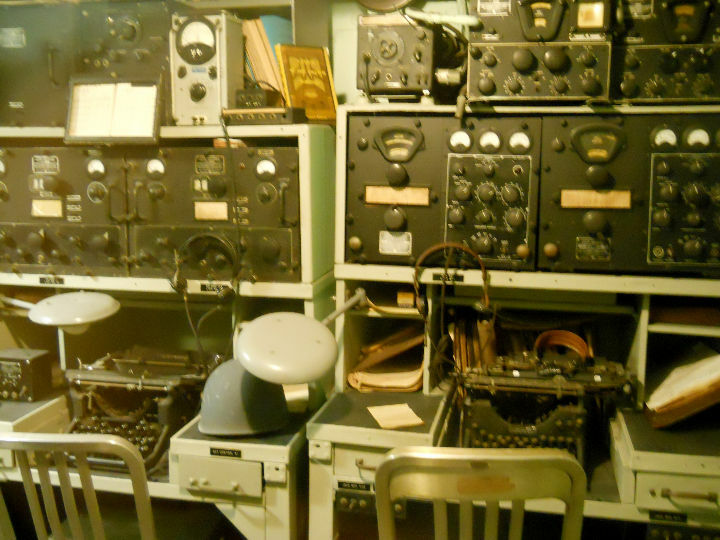 < Radio Room. 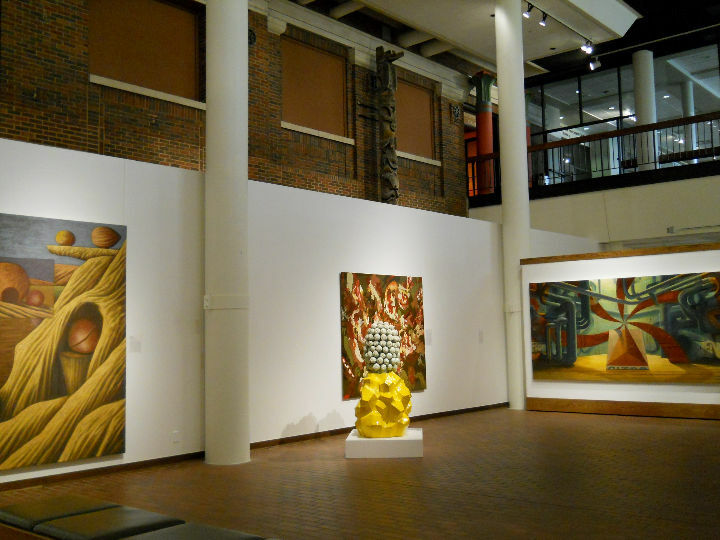 [Saturday] In the morning we went to the Neubig Art Gallery/Studio to see Louisiana Mud Painting. Henry Neubig is a Louisiana artist that uses pigments from the alluvial soils of his home state to create a personal palette that is surprisingly rich in hues. His paintings are quite impressive and unless you knew, you would assume they were painted from commercial pigments. Of course, we had to bring back a sample of his work. 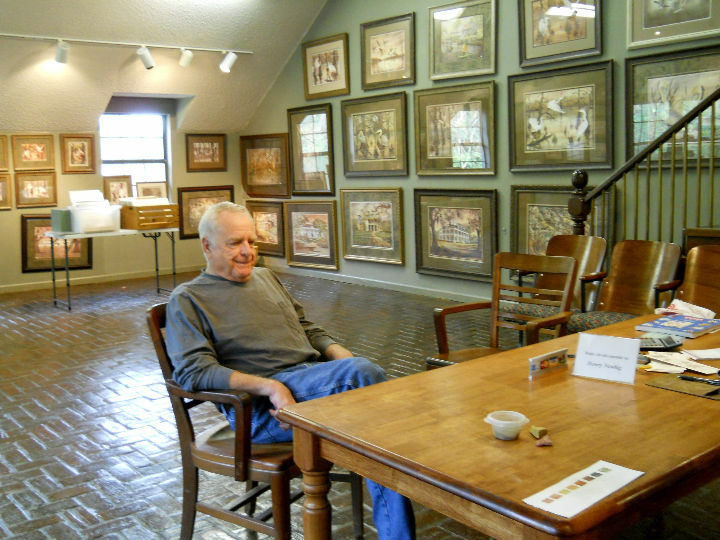 < Henry Neubig in his gallery. < The one we brought home. In the afternoon, we drove to downtown, expecting to tour the Old Capital, but when we arrived, we saw a sign that it was closed to undergo some renovations. We were able to photograph it from the outside. 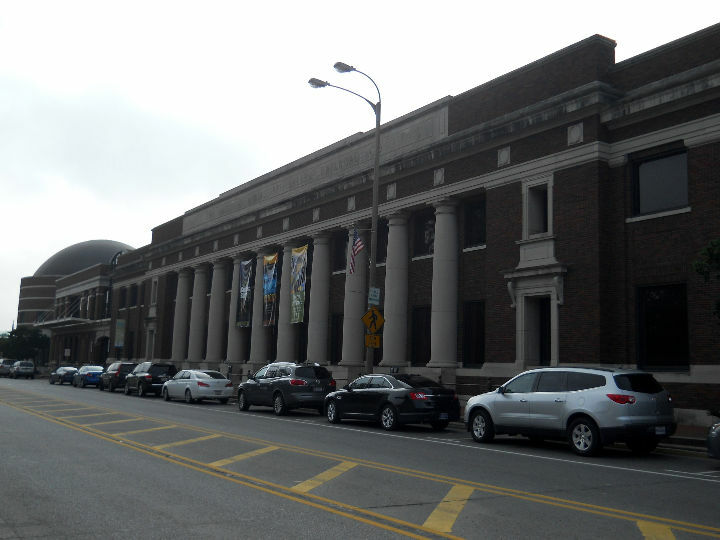 Across the street from the Old Capital is the Louisiana Art & Science Museum, located in the old Yazoo and Mississippi Valley Railroad Company building. It was open so we spent the rest of the afternoon there. The art exhibits were interesting, with many examples of techniques that we had not seen used before. 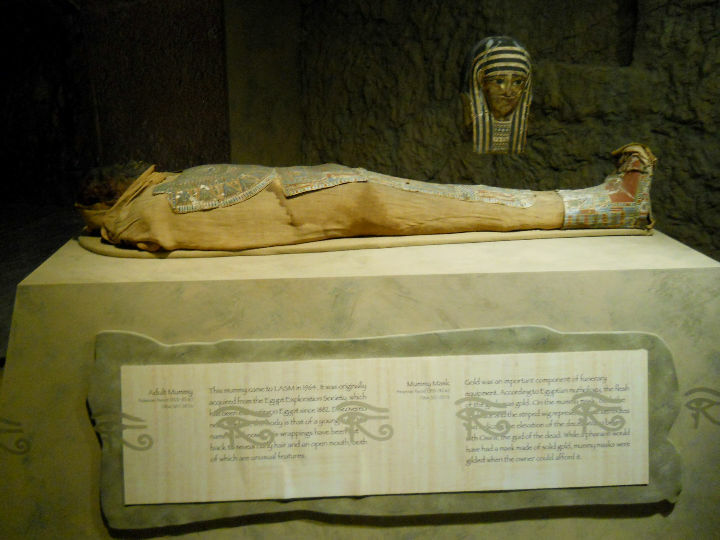 The Ancient Egypt gallery contains a real Egyptian mummy. The Irene W. Pennington Planetarium has a Solar System Gallery which is tailored for kids, but has many displays of interest to adults as well. All in all, it was a good way to spend the afternoon. 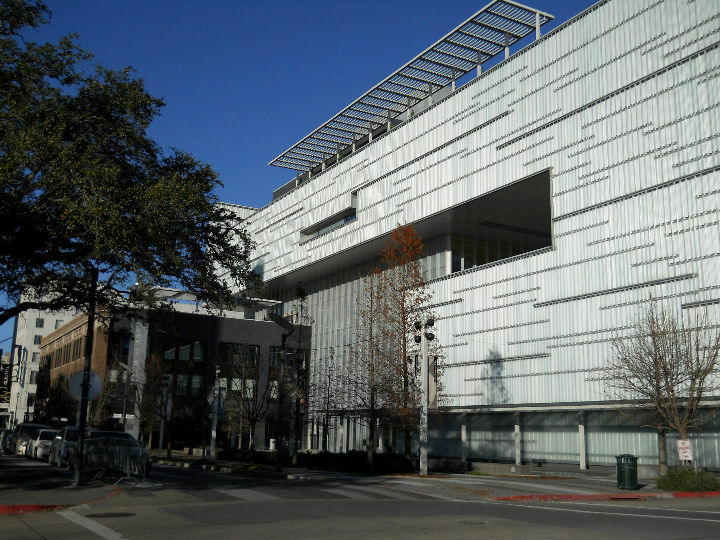 < LASM building. < One art gallery. < The mummy. 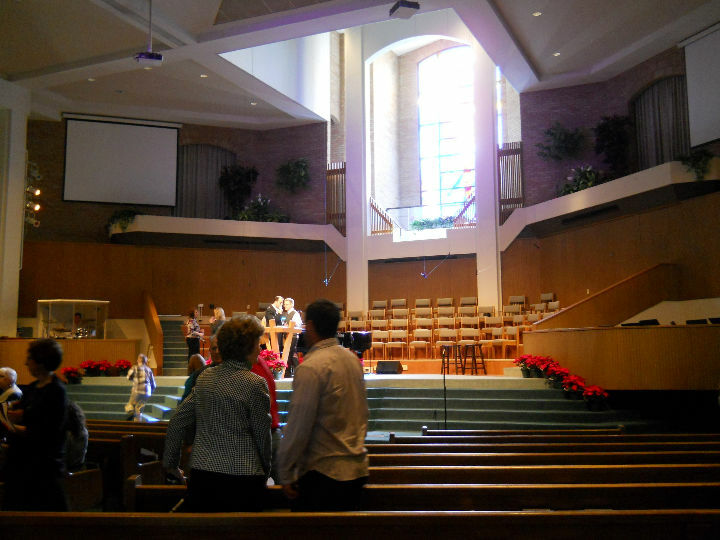 [Sunday] We always try to attend church when we are on vacation to worship with a local congregation and in a different environment to what we usually experience. We chose to attend the 10:15 am service at Florida Blvd. Baptist Church, which was conveniently located a few miles down Florida Blvd. from our RV park. They had a contemporary service and we learned that they were host for a Hispanic church and an African-American church that met in the same location at various times on Sunday. < Florida Blvd. Baptist Church. 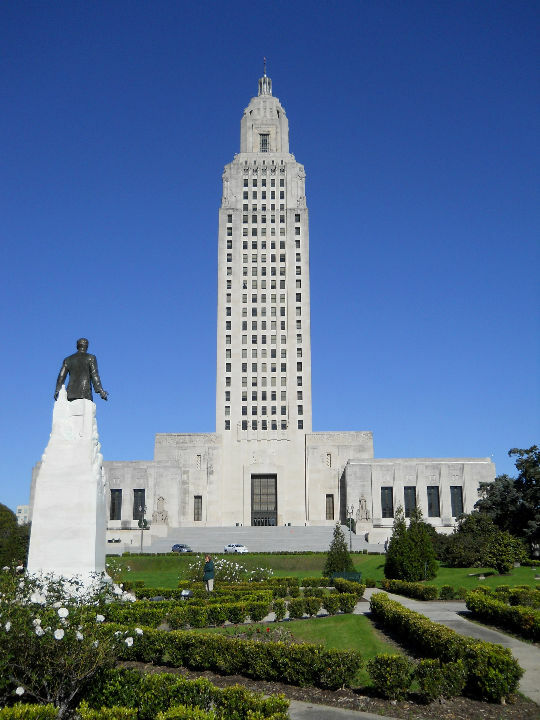 [Monday] In the morning we toured the impressive Louisiana State Capital. Built in 1932 by Gov. Huey Long in only 14 months, it stands 450 feet high and is the tallest state capital in the U.S. Twenty-five-hundred rail cars were needed to bring in the limestone used on the exterior and the interior marbles that came from distant places, including Vermont and Italy. The cost to complete was a modest $5 million. An observation deck is on the 27th floor and overlooks Baton Rouge at 350 feet. As a bonus on the observation deck was professional football player, Frank Pitts, wide receiver for the Kansas City Chiefs in the 1970 Super Bowl IV game with the Minnesota Vikings. Kansas City defeated Minnesota, 23 to 7. He is now a Sargent-at-Arms with the state Senate. 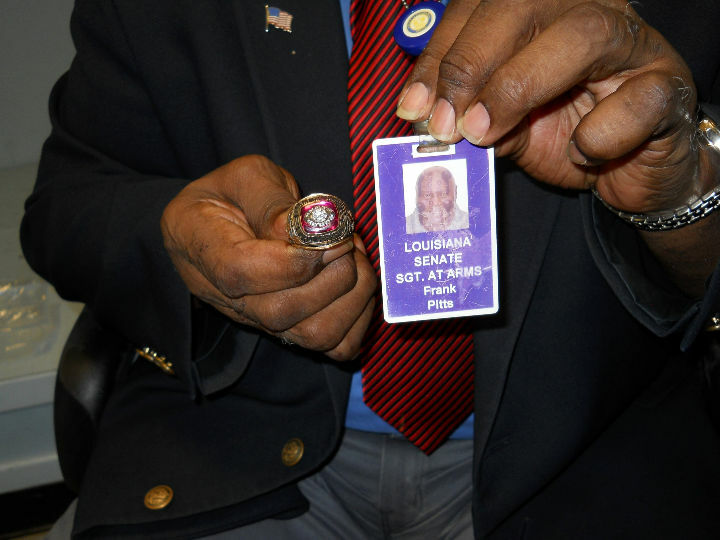 He was kind enough to let us photograph him with his Super Bowl ring, which was larger than Lawson's thumb would fill. It was interesting to hear him relive some of his experiences from that era for other visitors and us. 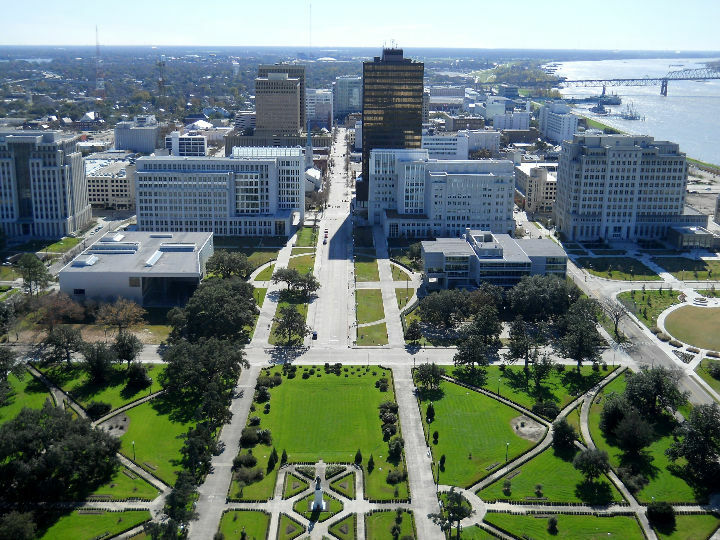 < < Louisiana State Capital < View of Baton Rouge from observation deck. 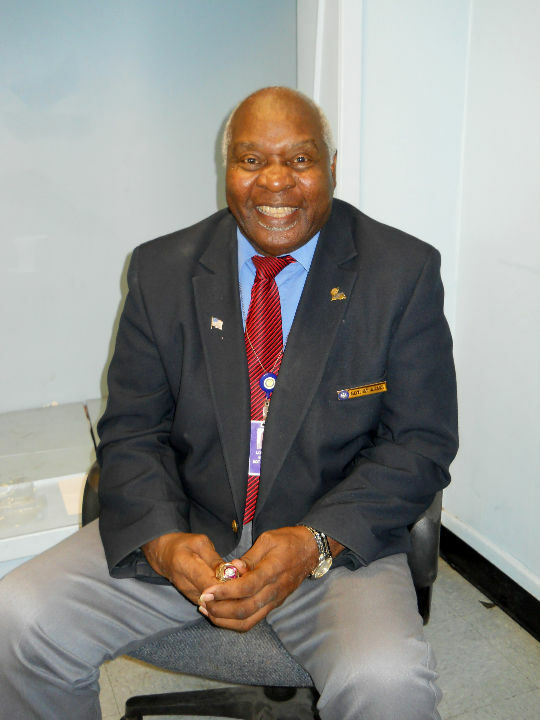 < < Frank Pitts with his 1970 Super Bowl IV ring. In the afternoon, we toured the LSU Rural Life Museum. 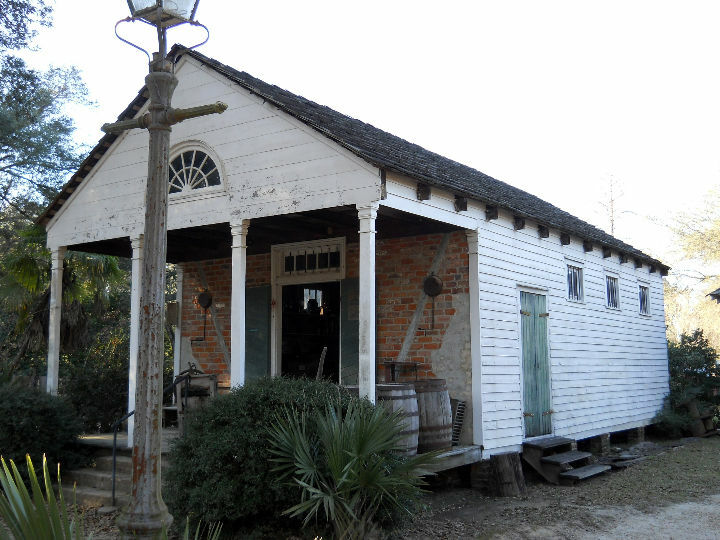 The museum holds the largest collection of Louisiana vernacular architecture and the most extensive collection of material culture artifacts from the 18th and 19th centuries. There are 32 buildings which spread over 25 acres. 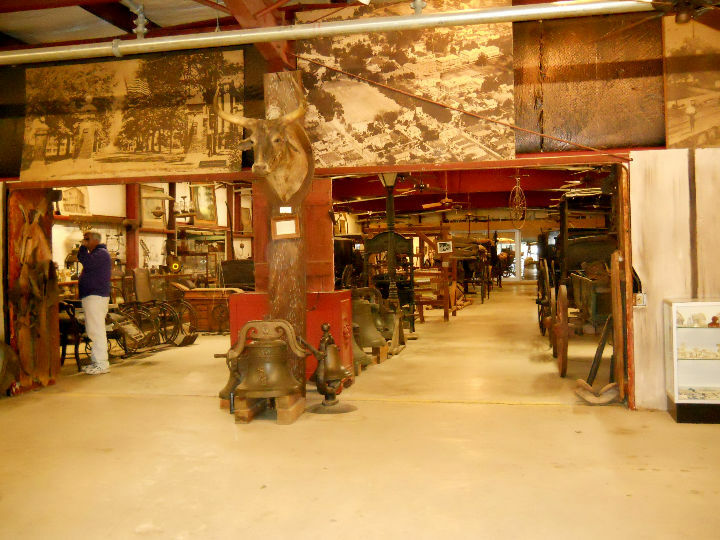 It's well worth the visit, but they have so many items in the museum building, that it could stand to be organized better. 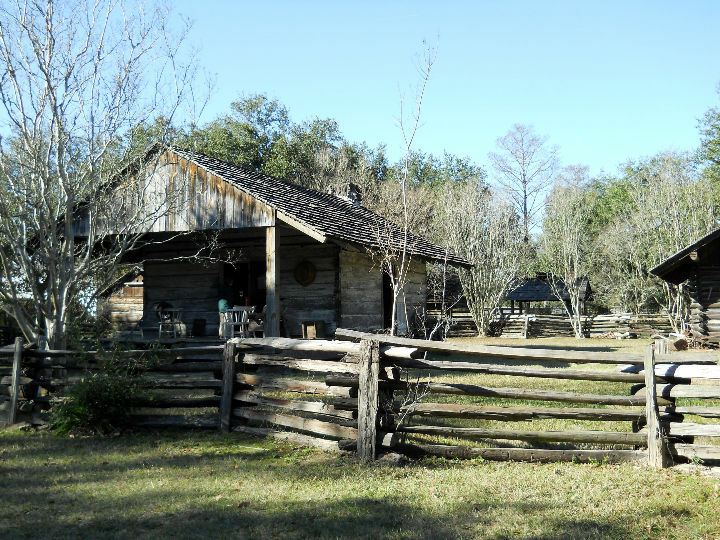 < < < LSU Rural Life Museum. 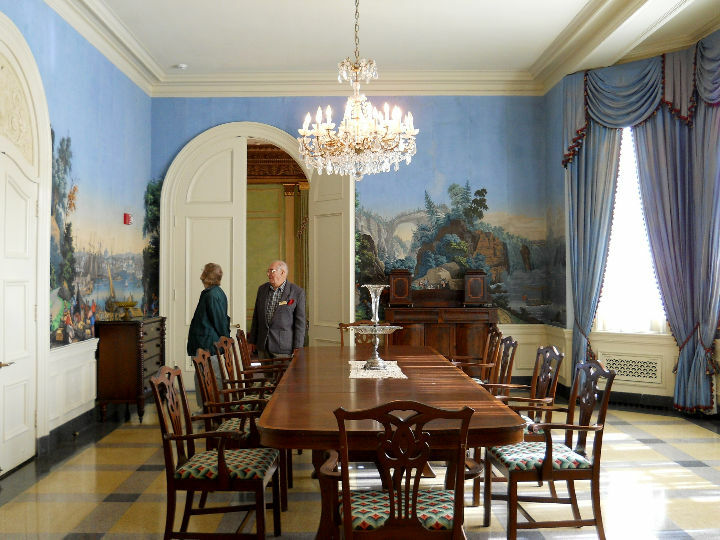 [Tuesday] Before lunch we toured the Old Governor's Mansion. 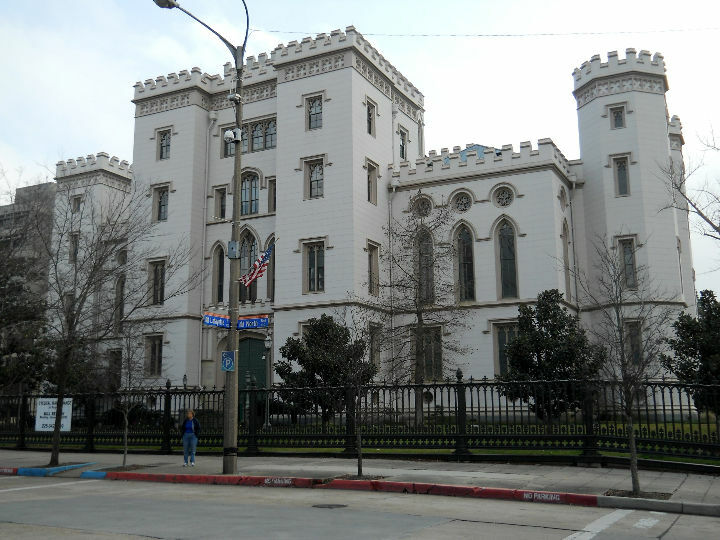 This Georgian mansion was constructed in 1930 for Gov. 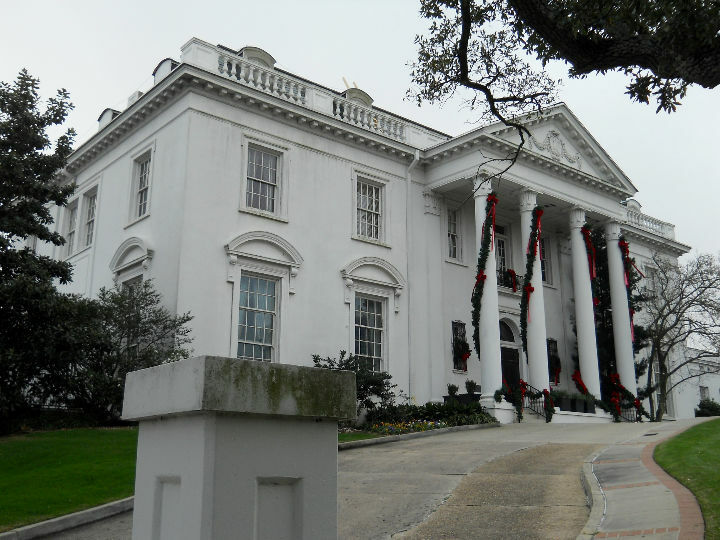 Huey Long and is said to copy the White House in Washington, DC. It was replaced by a new Governor's residence in 1961. 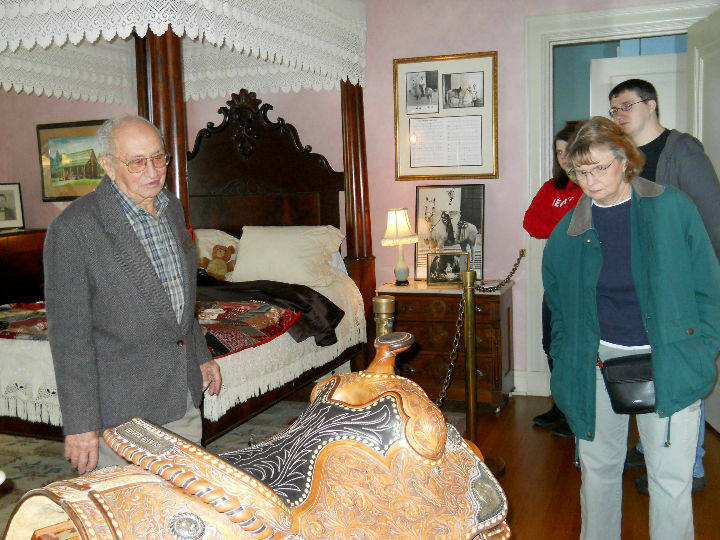 Our guided tour was excellent and several of the rooms contained former governor's belongings donated by the families. < < < Old Governor's Mansion. We at lunch at a local favorite, Boutin's...A Cajun Music & Dining Experience. We thought the food was good. After lunch we toured the LSU Museum of Art. About a third of the displays had been removed for a change of content, so the lady let us view the remainder free. There was still lots of unusual art with many pieces using techniques we haven't seen before. Displays ranged from Chinese Jade, Alfred Hitchcock Presents, LSU Art, and European to Early American. 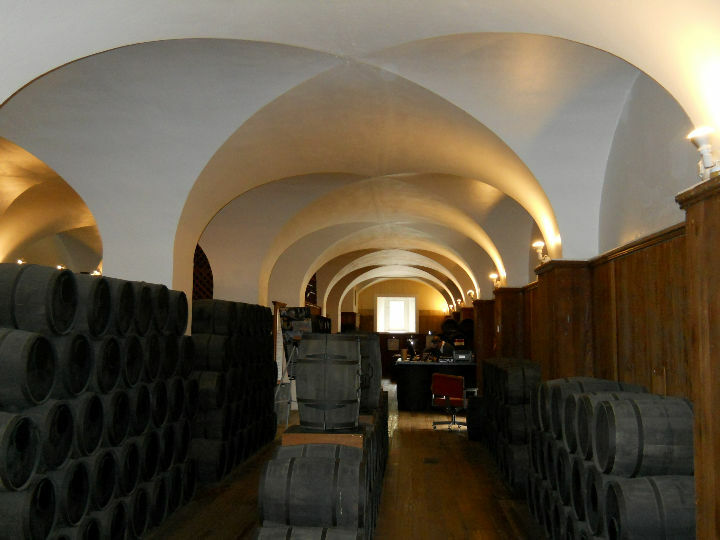 [Wednesday] In the morning we went to the Old Arsenal Museum. It is located next to the state capital. Built in 1838, the compound supplied weapons and ammunition to Confederate troops at the onset of the Civil War. In the afternoon, we drove to the Bluebonnet Swamp Nature Center. 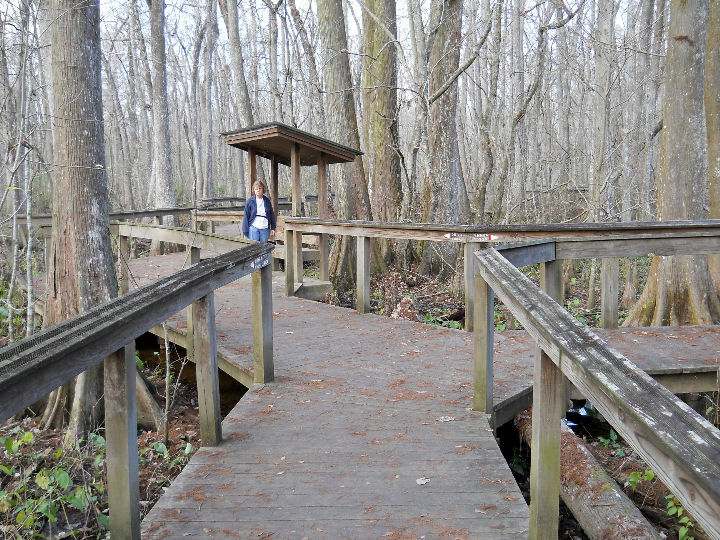 They have an interesting nature museum and well as several nice boardwalk nature trails through the swamp. We saw and heard quite a few birds on our walk. < < Bluebonnet Nature Center. [Thursday] In the morning, we wrapped things up by driving to a nearby place to refill on of our empty propane tank, looked around the immediate neighborhood, gassed up the truck and after lunch we departed from Baton Rouge. 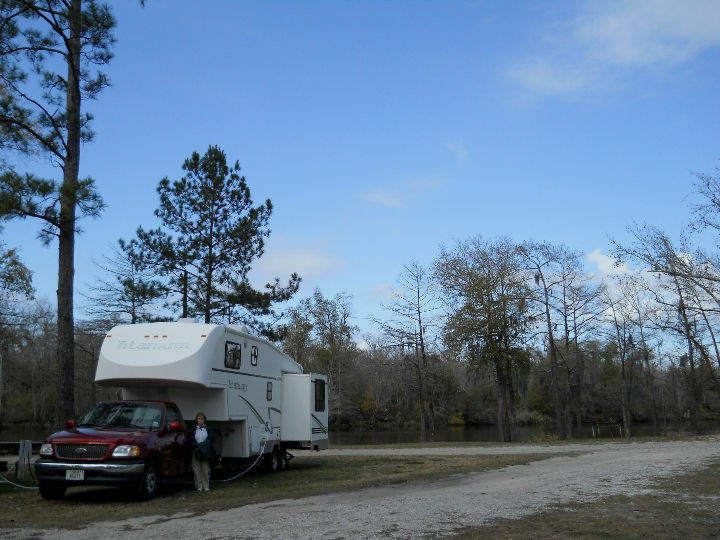 We drove West on IH-10 to Lake Charles and Sam Houston Jones State Park, where we settled into site #62 - nice park and nice new site. It was too late to do anything else today. [Friday] After breakfast, we walked along the Orange Trail (Riverwalk Trail ~1.6 mi.) 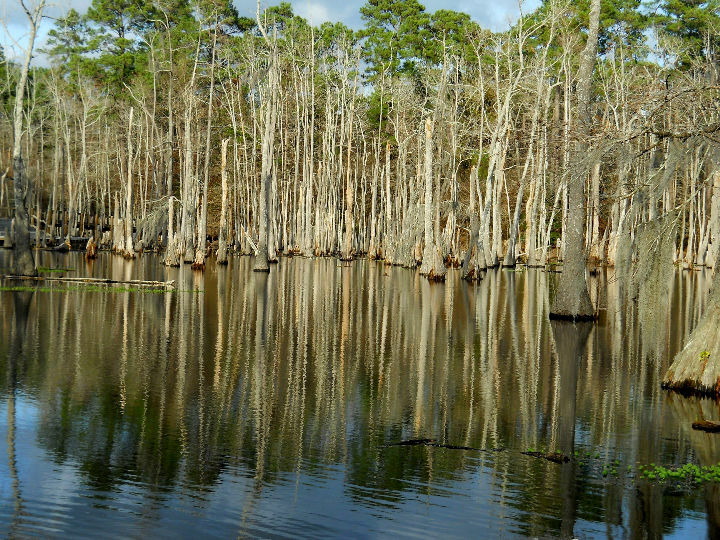 which most of the way parallels the Calcasieu River. The birds were active so we saw many as we walked along the good trail. 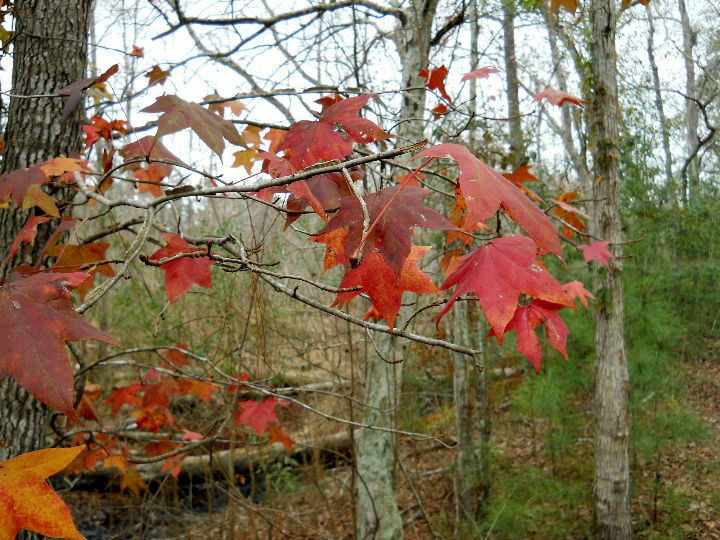 In the afternoon, we walked the Red Trail (Cypress Tupelo Trail ~0.5 mi.) and saw many birds including Bluebird, Dark-eyed Junco, Yellow-rumped Warbler and many more. The weather was near 70 and partly cloudy, so perfect weather. 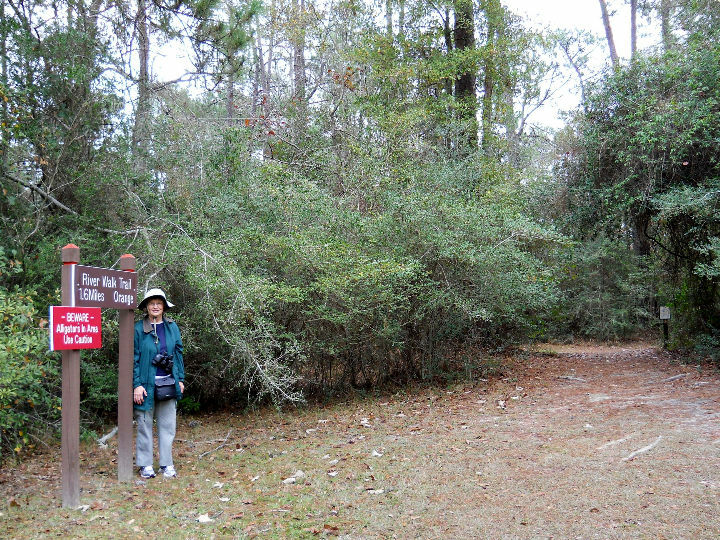 < Kay at Riverwalk Trailhead. 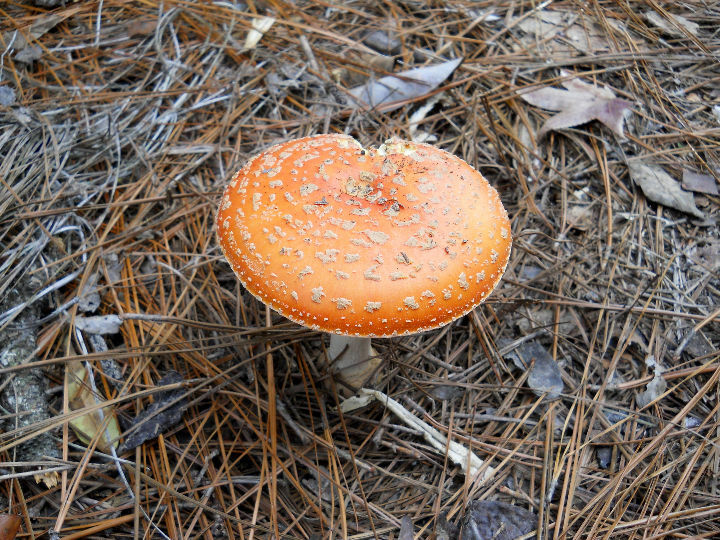 < < < Along the trails. [Saturday] We made our way west on IH-10 again and arrived home in the early afternoon. This draws to a close our visit to Baton Rouge and Southern Louisiana. We hope you enjoyed the photos and brief descriptions of our activities. God willing, join us again soon for another RV adventure.